Be the first to share your favorite memory, photo or story of Larry. This memorial page is dedicated for family, friends and future generations to celebrate the life of their loved one. Larry Brownfield, age 63, of Trivoli, passed away on Saturday, November 17, 2018 at home. Larry was born on April 24, 1955 in Peoria to Harry and Kay (Shannon) Brownfield. He married Diana Roberts on June 14, 1978 in Peoria. Surviving are his wife, Diana; his daughter, Danielle (Ryan) Winkle; two grandchildren, Rogan and Oliver Winkle; his brothers, Mike (Jackie) Brownfield of Chillicothe, IL, Bill (Amanda) Brownfield of Washington, IL and Greg (Teri) Brownfield of Texas; his half-brother, Gary Brownfield of the Chicago area; and several nieces, nephews and cousins. He was preceded in death by his parents. 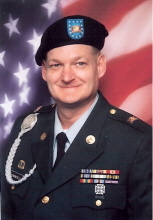 Larry served in the U.S. Army for 27 years and retired as Staff Sergeant. He was an electrician with the IBEW Local 34 for 20 years before retiring. Larry was a member of the VFW in East Peoria and he loved hunting, especially deer, and enjoyed fishing, gardening and traveling. Larry loved his family and enjoyed their family gatherings. Services will be held on Wednesday, November 21, 2018 at 11am at The Wilton Mortuary in Peoria. Visitation will be held one hour prior to the service at the funeral home. Rev. Howard Love will be officiating. Burial will be at Lutheran Cemetery in Peoria with military honors. In lieu of flowers, memorials may be made to Illinois Cancer Care. "Email Address" would like to share the life celebration of Larry Brownfield. Click on the "link" to go to share a favorite memory or leave a condolence message for the family.